I've been feeling under the weather. I had to call in sick to work today (one of my least favorite things to do). I spent the day in bed sleeping the day away with Bono Baby. I woke up to watch Doc Martin with my Mother-in-law and I am so happy that I did. 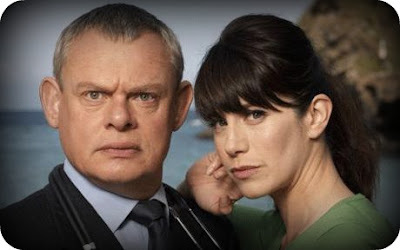 Doc Martin and girl time with my Mother-in-law helped me feel better. i'm sorry you're under the weather. i hope this finds you bundled up in comfy pj's, drinking lots of liquids and feeling better. sending you hugs, laughs, and get well soon wishes. Thank goodness you were sick! i've been missing your posts. i love that woman's bangs.... bangs are just so wonderful... miss you!